Acquiring land in India is no easy business, as the Singur crisis showed. Here is another way. In today’s circumstances, lets assume that, say, Reliance plans an oil pipeline that needs contiguous areas of land. If any one of the landowners in the path of the pipeline holds out, the project will not take off, leaving Reliance with several non-contiguous pieces of land and a large hole in their pocket. In an alternative scenario, instead of buying any plot of land, Reliance could choose to buy an option from the landowner. The option will give Reliance the right to buy the land at the prevailing market (or agreed upon) price within a period of three years (for instance). This option can be valued using simple decision analysis tools in a matter of minutes, and would be an order of magnitude cheaper than acquiring the land itself. Reliance could then plan multiple pipeline routes and try to acquire options on each of the routes. The moment they have all the options on a particular route, they can exercise all the options on that route and acquire all the contiguous pieces of land. There are several benefits to this approach. First, as Reliance is a private party, they are not required to reveal the purpose of the acquisition. They can send out agents who don’t even need to reveal that Reliance is behind the acquisition. The government, on the other hand, is required to reveal the purpose of their acquisition, resulting in landowners realising that they can make a lot of money if they hold out. The cost of acquisition will now be based on a good deal between the private party and the landowner. Second, as exercising the option is a legal right, there is no necessity for state coercion of the individual landowner. If someone holds out even after selling an option, that will be considered contractual fraud, and we have a legal framework in place to deal with that. The government no longer needs to deal with mass protests, the police no longer needs to open fire on hostile crowds, and entrepreneurs no longer need to sink large sums of money in legal costs. 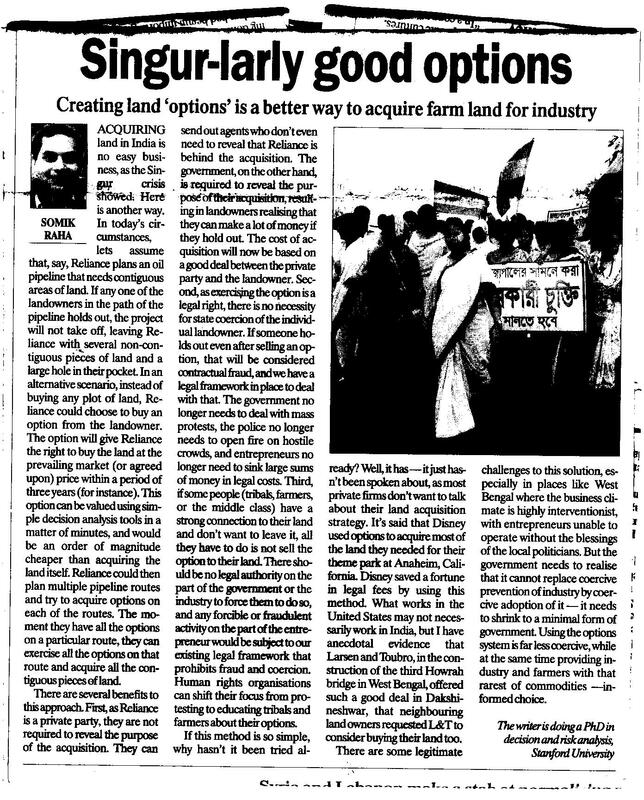 Third, if some people (tribals, farmers, or the middle class) have a strong connection to their land and don’t want to leave it, all they have to do is not sell the option to their land. There should be no legal authority on the part of the government or the industry to force them to do so, and any forcible or fraudulent activity on the part of the entrepreneur would be subject to our existing legal framework that prohibits fraud and coercion. Human rights organisations can shift their focus from protesting to educating tribals and farmers about their options. If this method is so simple, why hasn’t it been tried already? Well, it has — it just hasn’t been spoken about, as most private firms don’t want to talk about their land acquisition strategy. It’s said that Disney used options to acquire most of the land they needed for their theme park at Anaheim, California. Disney saved a fortune in legal fees by using this method. What works in the United States may not necessarily work in India, but I have anecdotal evidence that Larsen and Toubro, in the construction of the third Howrah bridge in West Bengal, offered such a good deal in Dakshineshwar, that neighbouring land owners requested L&T to consider buying their land too. There are some legitimate challenges to this solution, especially in places like West Bengal where the business climate is highly interventionist, with entrepreneurs unable to operate without the blessings of the local politicians. But the government needs to realise that it cannot replace coercive prevention of industry by coercive adoption of it — it needs to shrink to a minimal form of government. Using the options system is far less coercive, while at the same time providing industry and farmers with that rarest of commodities —informed choice.